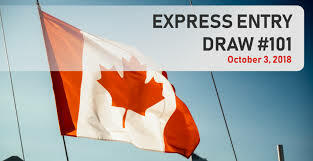 The Government of Canada has invited 3,900 Express Entry candidates to apply for Canadian permanent residence in a new draw held October 3. The minimum Comprehensive Ranking System score for this draw was 445. Today’s invitation round was the third draw from the Express Entry pool in three weeks and marks a return to 3,900 Invitations to Apply, or ITAs, for all-program invitation rounds — the largest number drawn in 2018. Candidates are ranked according to their Comprehensive Ranking System (CRS) score, which awards points based on factors including work experience, education, age and proficiency in English or French, Canada’s two official languages. The highest-ranked candidates are issued an Invitation to Apply , or ITA, through regular invitation rounds. This year has seen IRCC introduce large, standardized draw sizes that have increased gradually over the course of the year up to the current high of 3,900 ITAs. IRCC established a base of 2,750 ITAs over the first two draws of 2018 and then ramped up steadily by increments of 250 or 500 roughly every eight weeks, reaching 3,900 ITAs on September 5. The only all-program invitation round to deviate from this pattern was the Express Entry draw on September 19, when the draw size was reduced to 3,500. IRCC has now issued a total of 66,400 ITAs over 21 draws in 2018. Today’s CRS minimum of 445 is an increase of four points over the September 19 draw, which had a minimum CRS score of 441. The tie-break date and time used in this draw was October 2, 2018, at 04:02:11 UTC, meaning all candidates with a CRS score above 445, as well as those candidates with scores of 445 who submitted their profile before this specified date and time, received an ITA in this invitation round. Express Entry candidates can improve their ranking in a number of ways, including a provincial nomination that results in 600 additional CRS points. Express Entry-linked Provincial Nominee Programs (PNPs) have been very active in 2018, and new streams were introduced in Nova Scotia and Alberta over the summer. Every Canadian province and territory with a PNP now has at least one Express Entry-linked nomination stream. Anik is 34 years old, holds two Bachelor’s degrees and has been working as a financial analyst for five years. He has an advanced English language proficiency. While Anik has never worked or studied in Canada, his CRS score of 447 would have been high enough to obtain an ITA for permanent residence in the October 3 Express Entry draw. Nour is 30 years old, holds a Bachelor’s degree and has been working as a business consultant for three years. She wrote the IELTS and scored an 8 in each category. While Nour has never worked or studied in Canada, she has a sister who is a Canadian permanent resident residing in Toronto. Nour’s CRS of 448 would have been sufficient to obtain an ITA in today’s draw. Tor is 35 years old, has a Master’s degree and has been working as a professor for five years. Tor wrote the IELTS and obtained an 8 in each category. While Tor has never worked or studied in Canada, his CRS of 445 would have been sufficient to obtain an ITA in the latest draw. Malika is 30 years old, holds a Bachelor’s degree and has been working as a university admissions officer outside of Canada for 4 years. She took the TEF and obtained a score equivalent to CLB nine (9) in each category. Malika also wrote the IELTS, and obtained a score equivalent to CLB six (6) in all categories. Her CRS of 458 would have been sufficient to obtain an ITA in today’s draw.